Buying a foam surfboard can feel daunting… walking into a surf shop, there are endless choices. How can you possibly know the function of every little curve, edge, and line? Bombarding the employees with questions is getting you nowhere, and you still don’t know what half of the boards are meant to do. Don’t worry - we’ve filtered through tons of surfboards to provide you with a simple list of the best boards suited for every condition. Whether you’re surfing two-foot beach breaks or seven-foot barrels, South Bay Board Co has what you’re looking for. Perfect for surfing in little one-footers, or bigger waves up to 6 ft. Known as the “Foam Torpedo” for its high speed. ​It’s a strange irony that the materials we use to make surfboards are nonbiodegradable, and even toxic to the ocean. While there aren’t many options on the market for environmentally friendly surfboards, there is a simple way to reduce waste – buying a durable, long-lasting surfboard. Treating boards like they’re disposable isn’t good for the planet, or for your wallet. Luckily, South Bay Board Co., a California based surfboard manufacturer, makes a full quiver of boards that are meant to last. They use a unique combination of materials and a vacuum sealed strengthening process to ensure that their boards won’t end up in a landfill. The 7’ will allow you to surf waves up to six feet tall, so you won’t have to buy a new board as you progress to bigger waves. It’s built for speed with its narrow nose and thruster fin setup, making it easy to surf in all conditions. On top of that, it’s made with EPS foam and two layers of epoxy resin to ensure that it won’t crack under the pressure of big surf. The 6’8 Hybrid is a perfect mid-length board for waves of all shapes and sizes. The swallow tail keeps the board loose and able to turn, while the bigger size will help you balance in bigger surf. The deck is made of real bamboo for an old school style that this hybrid board will help you emulate. With EPS foam below the bamboo and two layers of resin above it, you won’t break this board no matter how often you ride it. 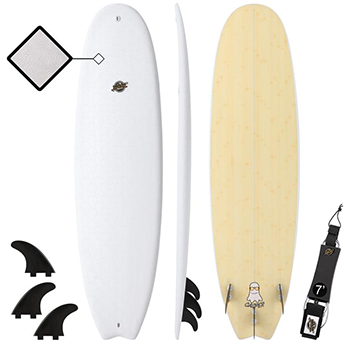 The 6’ Guppy is the perfect board for your little grom to learn on. They won’t have any trouble paddling this board around due to its wide and thick shape, but it’s smaller length will ensure that they stay in control. They’ll have it around long enough to teach their kids one day with its durable composition and weatherproof materials. The 5’8” Hybrid combines performance and power. 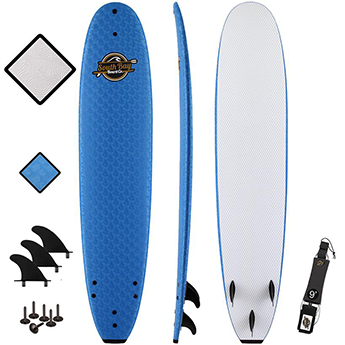 It has a fish tail for smooth carving, a narrow nose for easy takeoffs, and a wide deck for paddling power. No matter what size wave you’re surfing, this board will make turning look effortless. It even has a quad-fin setup for extra stability. Like the 6’8” Hybrid, this board is made of EPS, Bamboo, and resin for a long-lasting look and feel. SBBC is dedicated to making the most fun, durable boards on the market. Since they’re LA-based, they know first-hand what makes California surf culture so great – combining the love for the sport with the love for the ocean. To understand why SBBC boards are so much more durable than other brands, you need to understand basic surfboard materials. Typically, boards all have a similar makeup: a stringer, an inner core, and both an upper and lower “skin” material. A stringer is a wooden or fiberglass piece that goes vertically down the length of the surfboard to keep it from snapping in half or flexing. Most surfboards have one wooden stringer, while some have up to three. You’ll find that SBBC boards have two wooden stringers and an additional fiberglass center rod, giving each board 3x the strength and stability. There are three types of foam blanks that are commonly used as the inner core of a surfboard: Polyurethane, Polystyrene, and Expanded Polystyrene. - Polyurethane is the oldest material, and is easiest to shape by hand. It’s very fine textured, so it can be ripped (or “dinged”) easily. It’s also the most toxic material, and completely non-renewable. - Polystyrene is lighter and less durable than Polystyrene, but it is recyclable. It’s environmental friendliness has made it more common on the market, but unfortunately, it is at the sacrifice of durability. - Expanded Polystyrene has gained popularity as it is the lightest, the least likely to deteriorate over time, and it is recyclable. Expanded Polystyrene, aka EPS foam, does not trade environmental friendliness for durability, making it the most ideal inner core material. All of SBBC’s boards use EPS foam. The outside material of surfboard, which is what you can see when looking at it, is typically made from resin. This resin can be made from either epoxy or polyester (polyurethane). Epoxy resin is healthier alternative to polyester because it has up to 75% less chemicals that can harm both humans and the environment. SBBC boards use at least two layers of Epoxy resin to protect the board from dings or cracks. With a triple stringer, an EPS core, and 2+ layers of epoxy resin, their boards are made from the strongest materials on the market. After each board is assembled, South Bay Board Co. places their finished products into a vacuum chamber to compress the materials, and then heats the boards to allow the epoxy resin to harden. This is the strongest method of board construction on the market, so you can ensure that your surfboard is both durable and environmentally friendly. What Are Each of These Boards Best For? While each board has a specific function, all of SBBC’s boards are well-rounded and guarantee a great session in all kinds of surf. If you’re planning to ride bigger waves, the Hybrid boards re a great choice. If you have more fun relaxing in waves, then look no further than the 8’8” Heritage. For anything in between, the 7’ Fun Board is a great choice. Although, one of the best things about SBBC boards is their versatility in wide ranges of surf, so any of these boards will become your go-to in all sorts of waves. What Other Products Does SBBC Manufacture? While SBBC began as a board company, they’re expanded to include Stand-Up Paddleboards, Wakesurf Boards, Skimboards, and Body Boards. Clearly, all of your boarding needs can be met in one place. They also carry board bags, find, and paint pens to make your board design even better. 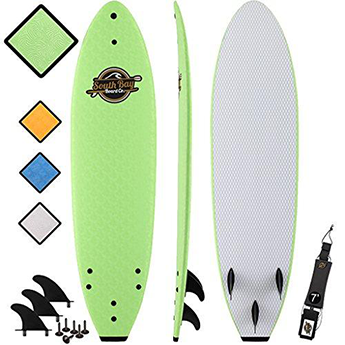 Are Fins and Leashes Included With a Board Purchase? 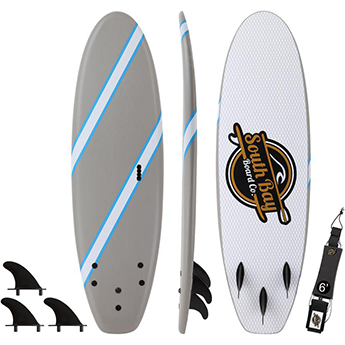 The perfect fin and leash setup come with each board. Depending on the board size you choose, SBBC will include the right fins and a leash long enough to make your first session easy as can be. You don’t have to worry about choosing the right gear because they’ve already done it for you. At the end of the day, we think that SBBC is the best one-stop shop for any surfer. They’re an A+ board brand because they carry a quiver full of versatile boards that you’ll be surfing for years to come. As a California-based brand, they understand that surfers love and respect our planet, so they use the most long-lasting and environmentally friendly materials on the market. 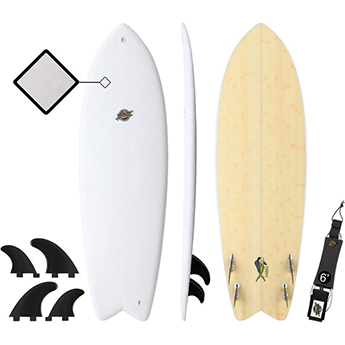 They cater to surfers of all skill levels by making a well-rounded assortment of boards. 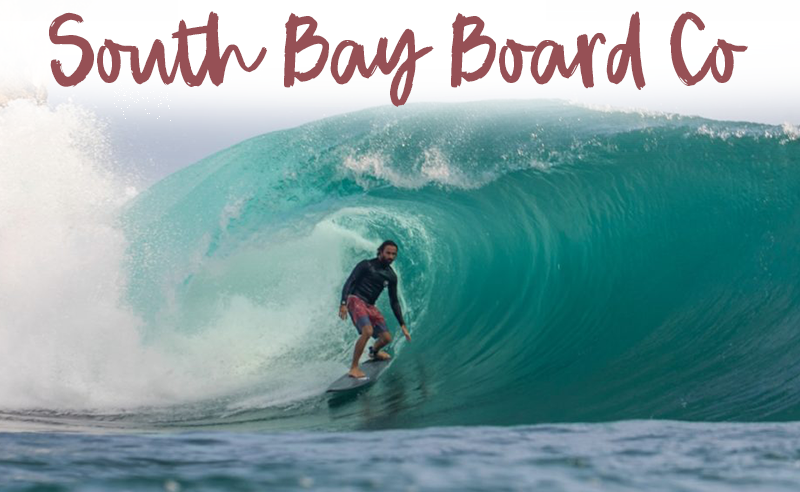 Whether you’ll be surfing whitewash or overhead waves, SBBC has a board perfect for you – they even have boards perfect for both conditions! We’re proud to recommend a brand that was started by surfers, for surfers. Their headquarters is in Los Angeles, but their boards are accessible all over the world. Choosing South Bay Board Co. for your next surfboard is a decision that we’re sure you won’t regret.